Atlanta is becoming growing market because of commercial and industrial companies thriving there. Increases in jobs, office space, and conference rooms. Financial website NerdWallet recently ranked Atlanta as the best city to start a business, as well as a top ten city for women entrepreneurs. Based on annual income and median rent price, Atlanta was ranked the #1 city for new college grads in 2013 by Forbes and Rent.com. The Metro Atlanta Chamber ranked Atlanta in the top ten metros for job growth, based on the number of new jobs from 2011-2012. Boxer believes in Atlanta as a growing market because we see many companies thriving there. With jobs increasing, finding additional workspace is the next step for a business. What’s more is Atlanta offers benefits to businesses located in Opportunity Zones. The Opportunity Zones in Georgia are created by local governments to encourage growth in older commercial and industrial areas. These zones could provide a tax credit incentive, up to $3,500 per job created, if a business qualifies. It is available for new or existing businesses that create two or more new jobs in Atlanta. If you, as a business owner, were to average four office users per 1,000 square feet, this would be equivalent to $14 per square foot in tax savings, which is a substantial discount on overhead real estate costs. Atlanta has long been recognized as a mecca of industry. The home of seven Fortune 500 companies including Coca-Cola, United Parcel Service, Home Depot, and Delta Air Lines, Atlanta’s commercial market continues to grow at an exponential rate. This thriving business community has produced increases in jobs, office space, and conference rooms. Atlanta is becoming a premium market because of commercial and industrial companies thriving there. Increases in jobs, office space, and conference rooms are happening at a phenomenal rate. 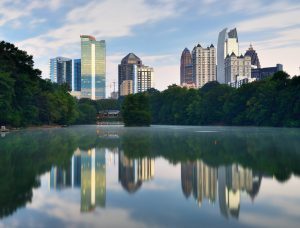 It is no wonder that businesses are choosing Atlanta for their base of operations. Atlanta is a prime location now to start or grow a business. If you have a great idea then you want to strike while the iron’s hot! Many Boxer Property locations are located in Atlanta’s Opportunity Zones and can accommodate businesses of any size. For more information, Chat Live with us or call 404-688-RENT.